Following months of coalition negotiations, a new German government has finally taken office. But what does the new government mean for the EU? 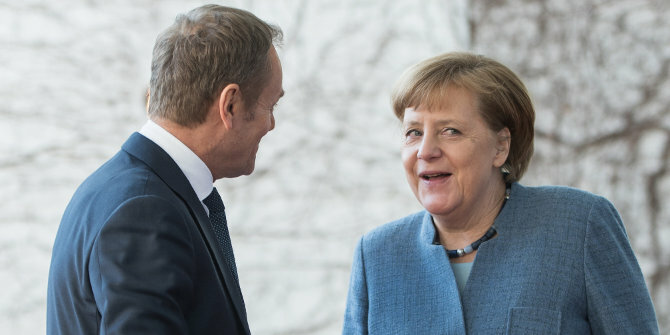 Alessandra Pozzi Rocco writes that with her next term in power now secured, Merkel has the chance to craft EU history further, notably by forging ahead on common defence and security. Berlin has a freshly installed government – at last. Six months of coalition negotiations reminded the 28-country bloc of how central and necessary a steady German leadership is for EU policymaking. After getting through several crises, the EU is now seeing stable economic growth and a calmer political climate. But the window of opportunity to push further economic and political integration is right before our eyes, and it is up to our leadership to seize this new momentum. Now. The stars are aligning. The unique combination of factors shows the time is ripe for concrete policy action. First, the EU’s security is threatened by a wide array of risks: its closest neighbour turns out to be a revisionist Russia annexing Crimea and leading a proxy war in Eastern Ukraine based on hybrid conflict practices. The divisive Western public opinion over fake news and the use of energy supplies as a tool for influencing Ukraine at freezing winter temperatures make eastern EU members highly concerned, and the neighbourhood broadly more unstable. Looking South, although ISIS has almost ceased to exist, terrorism still proliferates in lawless parts of the MENA region. It is less stable than ever and poses direct threats to EU security through migration flows and terrorism. In 2016, more than 65 million people were displaced, fleeing conflict around the world. Angela Merkel reacted by taking in one million refugees, but also by allowing military steps that would have been unthinkable before 2014: her government has sent, for the first time since WWII, lethal support into an active conflict zone. And this has been little remarked upon in the media, if at all. It could be considered as either deeply contradictory to Germany’s pacifist culture or as a mindset evolution amongst the establishment based on the premise that the German public needs to be protected regardless of the cost. Second, Europeans always looked West for support, friendship and partnership in addressing challenges of the future. Today, Brussels hardly understands Washington, which is making relations as difficult as they are unpredictable. Recent evolutions in EU foreign policy – notably the awakening of PESCO sleeping beauty (Permanent Structured Cooperation, included in 2009 Lisbon Treaty) and the European Defence Fund – are a direct consequence of three interrelated factors. The first is the unreliability of American rhetoric over the past year on NATO – obsolete no longer, solidarity if 2% of GDP is allocated to military spending, or unconditional solidarity to its oldest and closest allies? Second, the strong concern of eastern capitals, which used to look at NATO for protection and reject further EU defence policy based on arguments of unnecessary duplication is no more. And third, the eternal veto to any European development in defence posed by London has now disappeared with Brexit. To think that she is leading the most ambitious reform of the Bundeswehr to date with these objectives in mind brings good hope that her plan will materialise and make Berlin’s military capabilities reliable for allies in out-of-area missions. Bearing in mind that foreign policy is devised harmoniously between political leadership and expert networks in Berlin circles, all this translates into a greater German readiness to act on EU foreign policy altogether. Overall, most recent opinion polls (Pew Research Centre) find the German public to be more concerned by security than in the past, and more receptive to EU action in the field. However, surprising numbers show there is a stark need for better communication by the leadership: less than 30% would support a NATO intervention in helping an ally under attack. Germany’s approach will be a tailored one, reflecting both its culture and continued pressure from allies for more responsibility in the field. Berlin is working to lead from the middle, foster cooperation, boost EU capacities, facilitate consensus and act as framework nation for military operations. It also walks a fine line on the perception by eastern patterns, who fear a dominant Germany would bring back dark memories. In all, it pursues the objective of making 27 voices fall into one that is heard and listened to on the international stage whilst not creating any competition to NATO. At last, it is now also a matter of legacy for Angela Merkel. Onto her fourth term, she is in a weaker political position but definitely still enjoys the trust and goodwill from key partners. As she now does not need to put electoral concerns at the top of her list, it is a great time for her to build European history further. Detractors would, rightfully, ask how much of this is realistic if Germany still does not increase its military spending to meet the 2% GDP NATO target. But sometimes spending more to get faster results isn’t the key to success. Having structural blocks lifted and providing wider leeway to policymaking is a much more powerful change and one that does not happen that often. Note: A version of this article originally appeared at EurActiv. The article gives the views of the author, not the position of EUROPP – European Politics and Policy or the London School of Economics. “Six months of coalition negotiations reminded the 28-country bloc of how central and necessary a steady German leadership is for EU policymaking.” I guess after 70-80 years of hindsight, the 28 country bloc forgot just how “central” the leaders of a united Germany have been in bringing absolute devastation and violence to the remainder of Europe. So just like clock-work, this Chancellor is on path to accomplishing the same in light of her delusional/treasonous “open door” policy from 2015. (After all, was it not the 1930s/1940s Chancellor who also did not recognize borders, and he just attempted to take as he desired)? If the current Chancellor is experiencing self-guilt for actions committed by other people, then she can seek counseling. As for the other EU faux-leaders who are turning to the Chancellor for leadership, then perhaps they should apologize to their constituents, and then resign. “Looking South, although ISIS has almost ceased to exist, terrorism still proliferates in lawless parts of the MENA region.” They also exist in Europe now, as the Chancellor’s border-free policy allow such movement to make terrorism flourish. “Angela Merkel reacted by taking in one million refugees,..”. Many of these people were wise enough discard their legal papers, then allege that they were Syrian and/or minors, and then given free passage to an essential lifetime of benefits for them and their offspring (whilst her fellow Germans live a frugal life to fund these benefits to other people). “It also walks a fine line on the perception by eastern patterns, who fear a dominant Germany would bring back dark memories”. The Chancellor once again is trying to take control of the governments of the Visegrad 4 nations (Poland, Hungary, Czech, Slovakia) by trying to topple/overthrow democratically elected governments by using her undemocratically unelected EU puppets to sanction them. Kaiser, Chancellor, Fuhrer; it’s all the same. I think this analysis is rather off. Washington is acting how it is due to European inaction. Perhaps Europeans don’t realise how severe global threats really are? Are they that oblivious that the West is in rapid decline and under threats in all theatres from Russia / Iran / China? I don’t think so,yet they are inactive (no real strategy, no real understanding of hard power needed etc). I think this author even fails to understand the severity of it? As do you always need to separate issues on trade or other matters from issues on direct geopolitics / hard power etc. I also think most of the conflation about NATO is between ‘more EU’ or ‘more European national governments’ as if one is more preferable than the other is irrelevant in the grand scheme of things from the US / Western perspective, it isn’t a primarily important issue. That is more a localised European matter on how they want to structure their power etc (with the primary impediment being Europe itself). I will also add Germany will never be a serious leader without significant military / geopolitical clout. The idea of Merkel being the leader of the West, or the leader of Europe on the global stage without significant military capabilities is laughable. This explains why Europe is so insignificant on the global stage. The answer is easy, increase capabilities. Obviously much deeper cooperation / connections with Washington is a must for both regions moving forward also considering the pressures on both. Germany faces tremendous headwinds moving forward. It’s only going to become more and more difficult moving forward. I.e. serious change is needed ASAP. Not minor alterations 7 years in the future. the bigoted alt-right brigade has finally arrived !